Kick off your visit on the 23rd (Mon): glide through natural beauty at Levi Ski Resort. Keep things going the next day: look for gifts at Akaslompolo Sportshop, then make a trip to Snow Village, then explore and take pictures at Ice Karting Levi, and finally have some family-friendly fun at Kid's Land. For maps, where to stay, and more tourist information, refer to the Levi trip planner . London, UK to Levi is an approximately 10-hour flight. You can also drive. The time zone changes from Greenwich Mean Time to Eastern European Time, which is usually a 2 hour difference. Traveling from London in December, expect Levi to be cooler, temps between -6°C and -15°C. Finish your sightseeing early on the 24th (Tue) to allow enough time to travel to Inari. On the 25th (Wed), gain insight with The Sami Cultural Centre Sajos, then examine the collection at Siida, and then take in the architecture and atmosphere at Pielpajarvi Wilderness Church. To see photos, other places to visit, ratings, and other tourist information, read our Inari trip planning website . Do a combination of bus, flight, and shuttle from Levi to Inari in 2.5 hours. Alternatively, you can drive; or take a bus. In December in Inari, expect temperatures between -7°C during the day and -17°C at night. 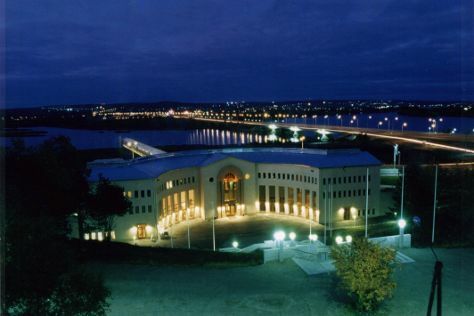 Finish up your sightseeing early on the 25th (Wed) so you can go by car to Rovaniemi. Kick off your visit on the 26th (Thu): take in the views from Lumberjack's Candle Bridge, get engrossed in the history at Arktikum, don't miss a visit to Lordi's Square, then see Santa Claus Office, and finally get in on the family fun at Santa Claus Village. On the next day, get in on the family fun at SantaPark - the Home Cavern of Santa Claus, then look for gifts at LAURI, and then buy something for everyone on your list at Arctic Circle Mall. For photos, where to stay, and more tourist information, go to the Rovaniemi trip planner . You can drive from Inari to Rovaniemi in 4 hours. Other options are to take a bus; or do a combination of shuttle and flight. In December, plan for daily highs up to -6°C, and evening lows to -13°C. Wrap up your sightseeing on the 27th (Fri) to allow time to travel back home.